Road Runner Girl: 3 Miles With The Sole2Soul Sisters!!! 3 Miles With The Sole2Soul Sisters!!! We had a group run at the track tonight with the Sole2Soul Sisters. We had around 30 ladies there...and lots of them were new!!! We have 3 different groups running this time...the Couch to 5K, 5K to 10K, and our runners from last time that couldn't wait and already started their 10K training! I ran with the 5K to 10K group tonight. They were supposed to run 3 miles. We started out at a slower pace but then I went ahead with the front of the group and Laura went with the back of the group. I ended up getting a really good run in! I ran 3 miles in 31 minutes and 33 seconds at an average pace of 10:31! What was neat is that I got to wear Christina's Garmin Forerunner 305 for the run! I looked on my wrist a few times and I was doing a 9:30 pace! I LOVE that watch and have GOT to get one!!! I've been begging Andy for one for awhile but haven't talked him into it yet. Maybe I will get one for my birthday...in November...boo! That seems like such a long time from now! Anyway, I am sooo proud of all the Sole2Soul Sisters! They are doing great! 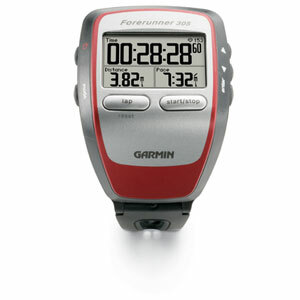 I just bought a garmin 305 last night. Ran with it today. About to post about it. I love my new toy! A Fast 5 at 5!! !